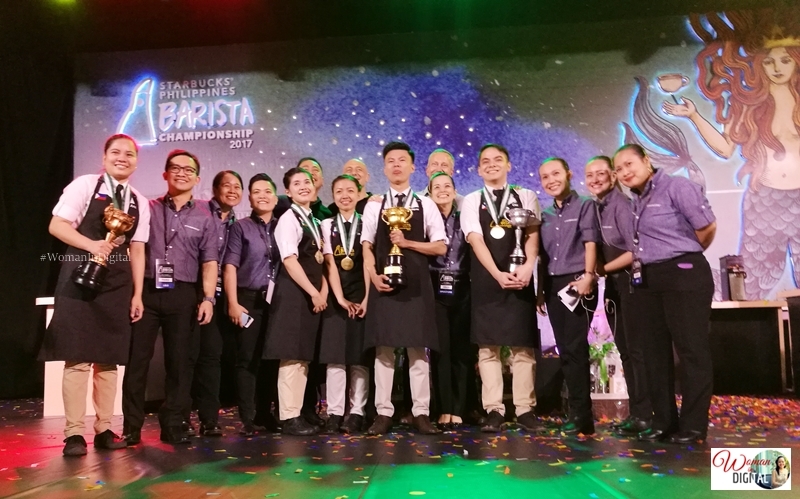 My Sunday afternoon was spent watching the 1st Starbucks Philippines Barista Challenge held at San Agustin College Auditorium. I was there not only for the brand but because there's so much to learn from baristas - from making great coffee to inspiring stories they tell. We had lunch at Starbucks San Antonio Plaza. It was my first time there and I find it cozy. There's also a Market Place by Rustans at the first floor. So it is noted that San Antonio Plaza is a nice place to do grocery shopping and then grab a quick snack afterwards. I had my favorite chicken salad sandwich and hot Salted Caramel Espresso. Starbucks served us their newest addition to lunch meals - cold soba and potato salad. They taste very good. Soba and potato salad will be available starting Tuesday, the 21st of February. After a quick lunch, we went to San Agustin auditorium for the 1st Starbucks Philippine Barista Championship. From thousands of participants, it went down to 12 then final six. From over 300 participants, only six Starbucks Global Coffee Masters showcased their passion for coffee at the Grand Barista Challenge. 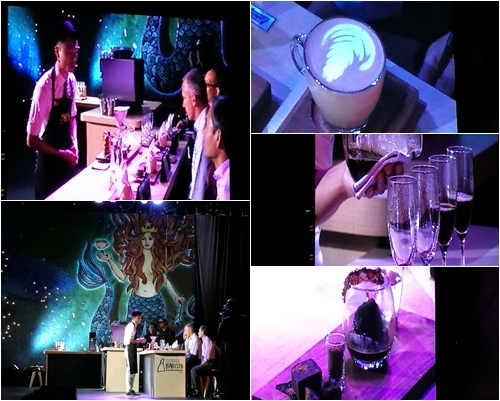 Inspiring us, the audience to create also our signature drink using any of the Starbucks coffee. During the competition, they were given 30 minutes to present their knowledge on coffee through Pour Over Coffee tasting and demonstrating Rosetta and freestyle latte art. Lastly, they have to showcase their creativity by preparing their very own signature beverage using other ingredients. 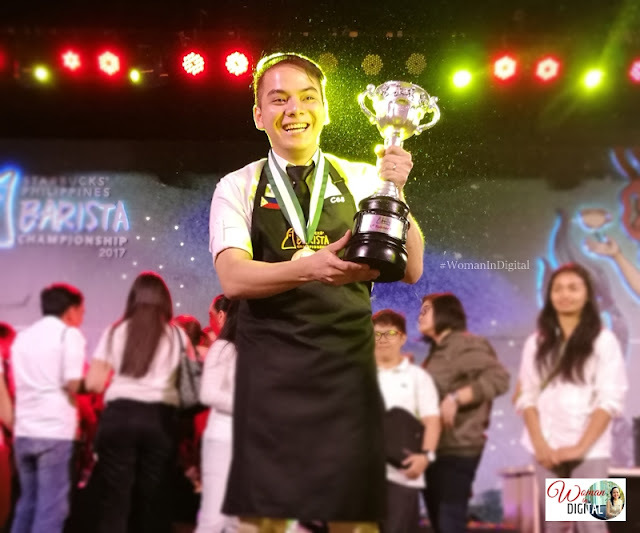 Grand Winner, Rafael Miguel Bautista will be representing the country for the Grand Barista Challenge in Taiwan this coming March. He said "coffee is the hero." He presented a fine dining experience highlighting Starbucks Espresso roast coffee. Miguel meticulously prepared the area including the equipment before he started the presentation. Coffee used: Espresso roast prepared in a personalized technique using the pour-over technique, counterclockwise manner, slow pouring to avoid over extraction and agitation from coffee. Coffee ice ball double strength espresso roast with liquid organic muscovado. He also coated one side of the glass with praline chocolates. First runner-up, Ces Ranillo (Starbucks Philcom) presented a unique beverage using coffee beans from Kenya, infusing fruit juices & carbonated water. Second runner-up, Ana Mendoza. Ana made pour-over iced Starbucks Reserve Tanzania using single espresso: tub shots, golden muscovado sugar, ripe mango, coconut milk and topped with pandan leaves. using the pour over technique, 20grams of coarse ground coffee in 300ml. 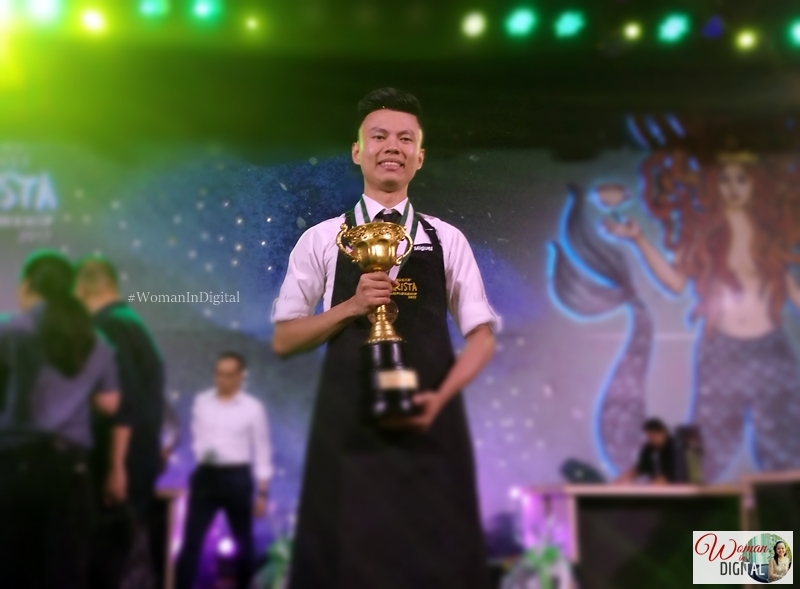 Eman called his signature beverage, Sampaguita refresher using samapaguita flower extract and sago. Carmina Fernandez from Starbucks The Sappire Bloc. She used Starbucks Reserve Malawi Sable. Camille Joy Cuyugan from Starbucks SM Southmall. Her signature beverage was Kenya sunrise, using grenadine syrup, ice cubes, mixture of orange and sparkling water. Finally, here's a short video. Enjoy watching! Congratulations to the six Starbucks baristas. You're all champions! Best of luck to Miguel and Ces, they will be our representative to the Starbucks Regional Barista Champion to be held in Taiwan on March 27, 2017.